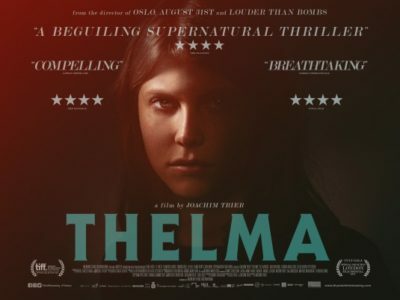 Joachim Trier’s thrilling Norwegian supernatural horror film Thelma opened with a shocking introduction. Tension is formed right away as Thelma finds herself at the other end of her father’s hunting rifle. The film follows young and naïve Thelma as she embarks on her first year away from her controlling and extremely religious parents. Her religion acts as the cause for much of her confusion as she falls in love with fellow student Anja; releasing powers unknown to Thelma and far from her control. Trier’s use of extreme lighting in the film carried with it a warning that flashing lights could trigger epileptic episodes in viewers. The extreme flashing is meant put you in the same disorienting mindframe that Thelma lingered in during the whole film. As the film continues you get a sense of the danger Thelma possesses in her body with her power to virtually banish people from the world, rendering them them to simply memories of the past. As Thelma’s powers progress, the horrific events of Thelma’s past are brought to light, shedding more knowledge on the severity of this power and the reason for her parents’ controlling ways. Thier’s take on forbidden love and guilt in Thelma was beautifully tragic. The film triggered emotions that were unescapable, placing you in the middle of what the characters faced.